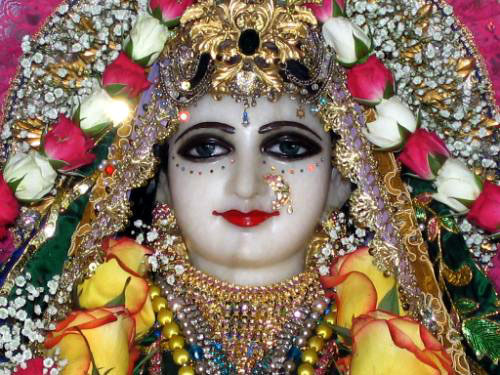 "In his book Ujjvala-nilamani, Rupa Gosvami explains the characteristics of Srimati Radharani. He points out that the body of Radharani is in itself an actual evolution of transcendental pleasure. That body is decorated with flowers and fragrant aromas and is complete with transcendental love for Krishna. That is the personification of His pleasure potency. That transcendental body takes bath three times: first in the water of mercy, second in the water of youthful beauty, and third in the water of youthful luster. After taking bath three times in that way, Her body is covered with shining garments and decorated with Krishna's personal beauty, which is compared to cosmetics. Thus Her beauty constitutes the highest artistry. Her body is also decorated with the ornaments of spiritual ecstasy -- trembling tears, petrification, perspiration, choking, cessation of all bodily functions due to transcendental pleasure, stumbling, high blood pressure and madness."